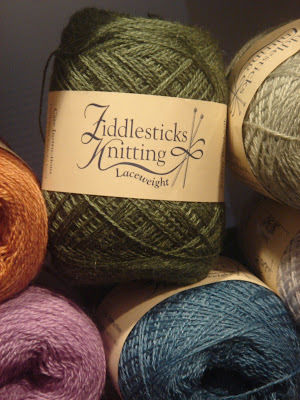 We recently received a big shipment of the Zephyr Laceweight Wool-Silk yarn. It’s a beautifully soft blend of 50% merino wool and 50% Tussah silk. There are some great new colours. 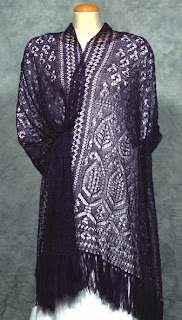 This was Alison’s first laceweight pattern – what a stunning accomplishment! Alison told us “… it was very straight forward to make and to block. 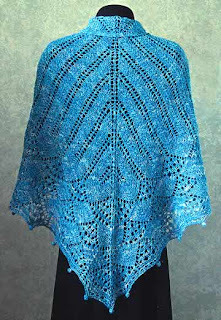 I simply adhered to all D. Siemens’ instructions, right down to the needle size et voila, a lovely shawl!” I’ll say. More from Alison on the shawl’s esthetic appeal, “…it has a sheen and is gossamer-like transparent…” And did we mention, simply exquisite? This entry was posted on Wednesday, October 17th, 2007 at 12:24 pm	and is filed under Uncategorized. You can follow any responses to this entry through the RSS 2.0 feed. Both comments and pings are currently closed.